“Cape Doctor” or “die Kaapse dokter” in Afrikaans is the local name for the strong, persistent and dry south-easterly wind that blows on the South African coast from spring to late summer. Although the wind smites a wide area of the sub-continent, it is notorious especially in and around the Cape Peninsula, where it can be unpleasantly strong and irritating. My first encounter with this strong wind I lost my umbrella and nearly got blown over while walking along the coast. All of these trees I found in Sea Point. 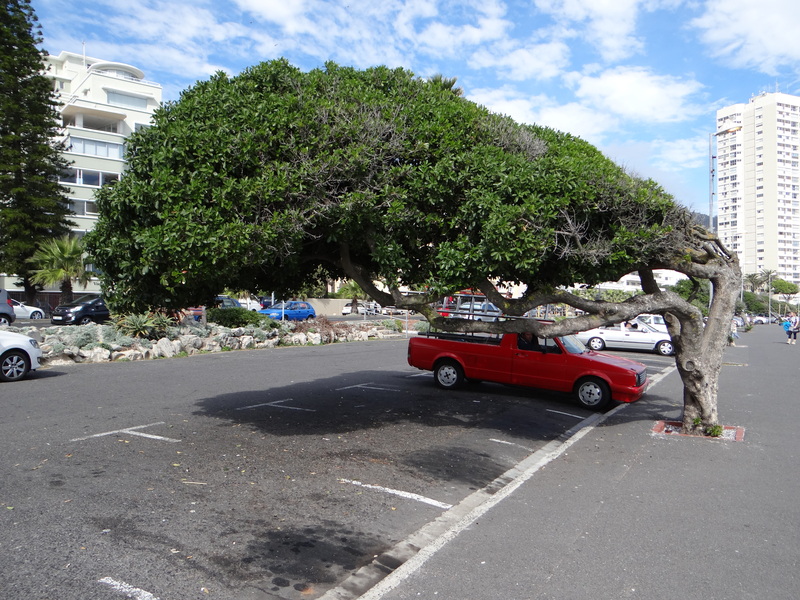 This wind is known as the Cape Doctor because it has long been held to clear Cape Town of pollution and ‘pestilence’ and is the reason for the slanting trees found all along the coast. It is quite unique to see all the trees along the coast slanted inland as they now grow away from this fierce wind that would kill them if they didn’t adapt. These trees are the most severe I have seen up to now and maybe the wind is just worse in this spot or these trees are not as strong as the others along the promenade. On a very hot day the wind can be a savior but when it rains it is a total nightmare! I think the Kaapse Doktor blew all the way to Pretoria this morning!!! That is not hard to believe as it feels like this wind can actually blow away cars. Well my little car at least. They don’t look real right? They do look man made…. The first time I visited CT, was very intrigued by these trees. And on later visits, actually used the shade to park our car! very fascinating. I haven’t had the opportunity to park underneath one yet but cant wait to do so! You’re welcome.With this strong wind blowing its a miracle that anything is left standing. You should see the ones on the Pacific Rim! Oh wow, now I cant wait to see them if they are even worse than these. Slanting trees…never heard of this before. 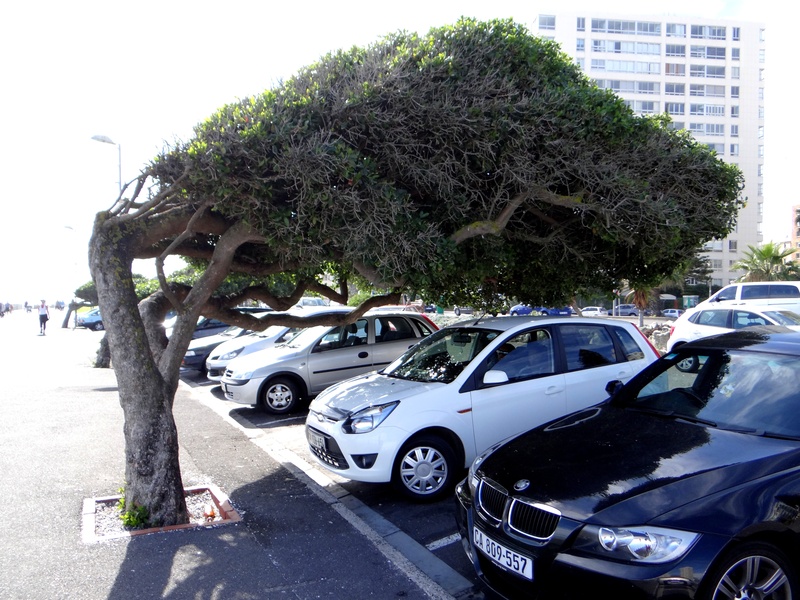 This is definitely not natural, the poor trees at least adapted to survive in this fierce wind. It is strange how far nature would go to adapt and survive. 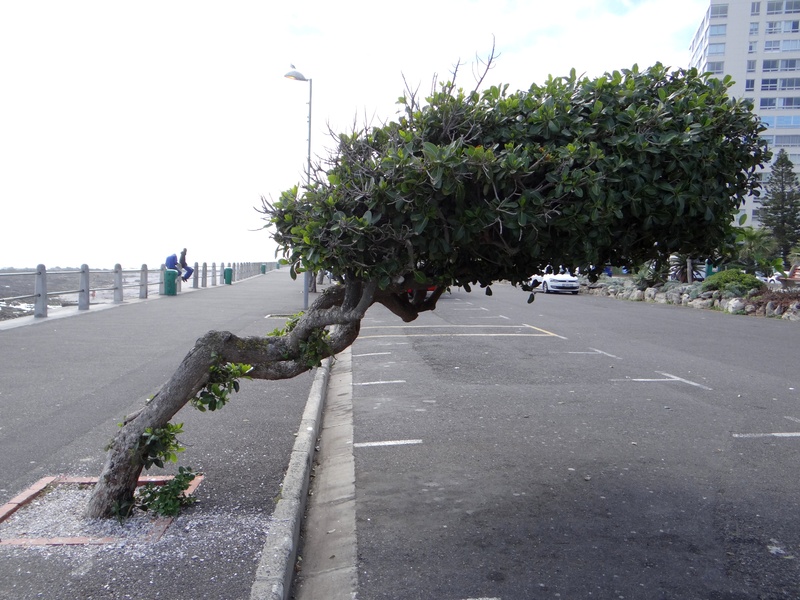 I always thought people over-reacted when they said that the Cape wind will blow you away. But it actually does and when it rains it is the worst, it then feels asif the rain is coming from the side and am umbrella is useless. Well mine is now as it got blown to bits the first time I used it here in Cape town. That’s lovely! I really like seing trees in “strange” alignments. It always shows how changeable nature is when it has to be. Nature sure does adapt to the strangest things just to survive. At first I thought the tree was “broken” maybe in a strong wind and only after seeing that there was a whole row of them did it dawn on me that they actually grow this way because of the wind.